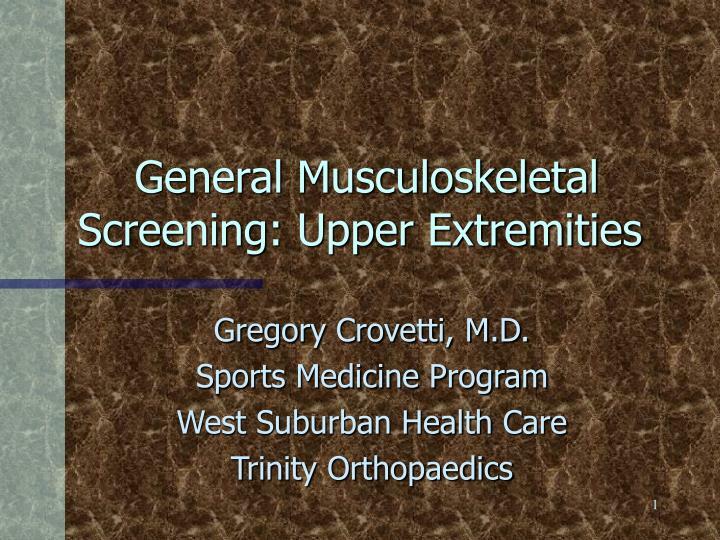 General Musculoskeletal Screening: Upper Extremities. 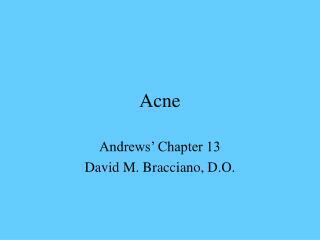 Gregory Crovetti, M.D. 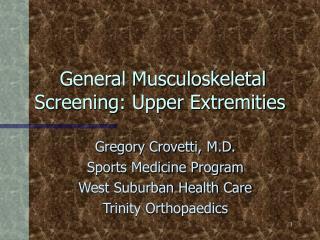 Sports Medicine Program West Suburban Health Care Trinity Orthopaedics. 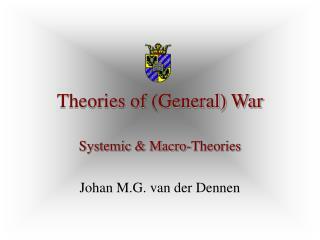 General Approach. 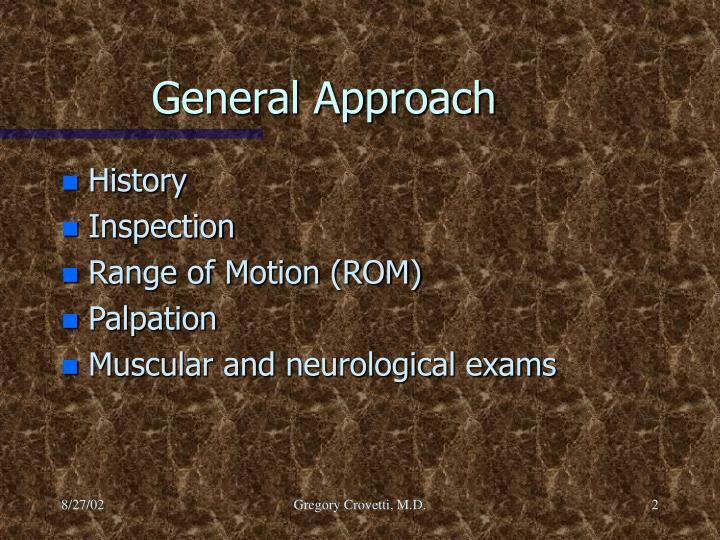 History Inspection Range of Motion (ROM) Palpation Muscular and neurological exams. History. 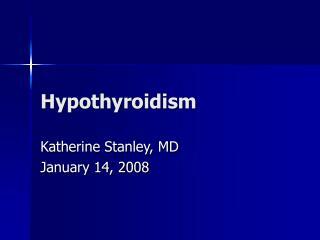 How symptoms started (mechanism of injury)? 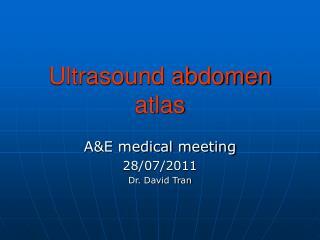 Location, nature of pain, or symptoms? 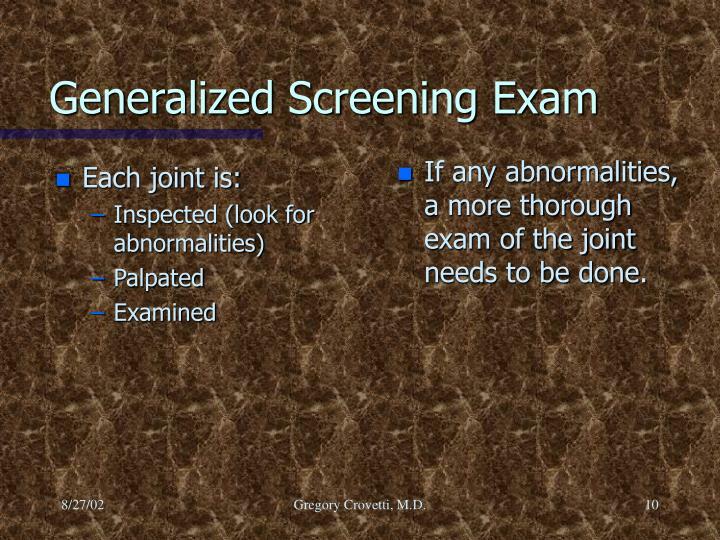 If any abnormalities, a more thorough exam of the joint needs to be done. 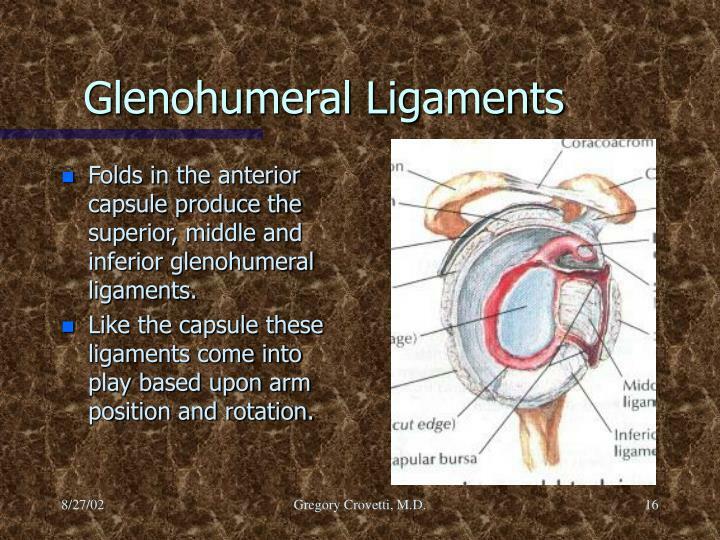 Folds in the anterior capsule produce the superior, middle and inferior glenohumeral ligaments. 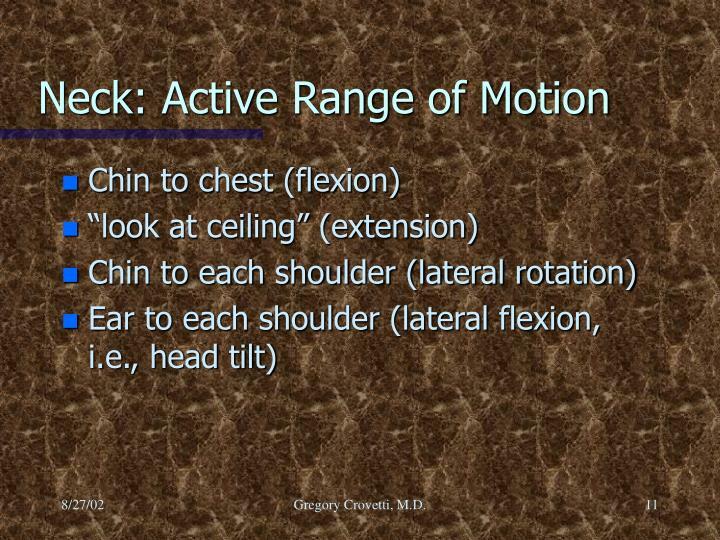 Like the capsule these ligaments come into play based upon arm position and rotation. 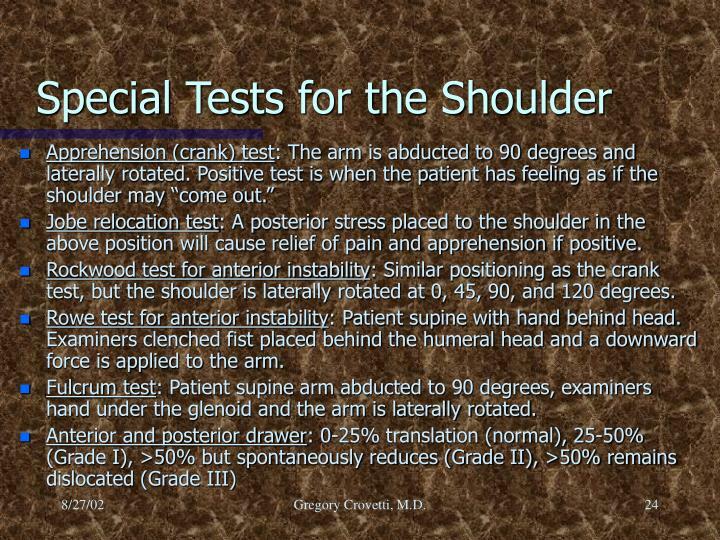 Rockwood test for anterior instability: Similar positioning as the crank test, but the shoulder is laterally rotated at 0, 45, 90, and 120 degrees. Fulcrum test: Patient supine arm abducted to 90 degrees, examiners hand under the glenoid and the arm is laterally rotated. 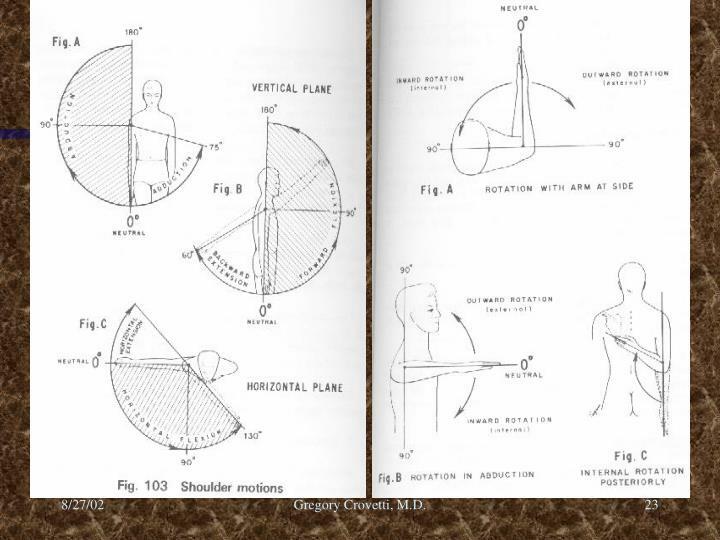 Feagin test: arm abducted to 90 elbow straight arm on examiner’s shoulder, a don and forward pressure is applied. 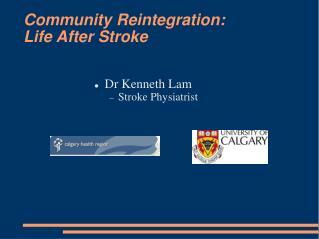 Positive if apprehension and presence of anteroinferior instability. Compression rotation test: Patient supine, elbow flexed and abducted 20 degrees, the examiner pushes up on the elbow and rotates the humerus medially and laterally. 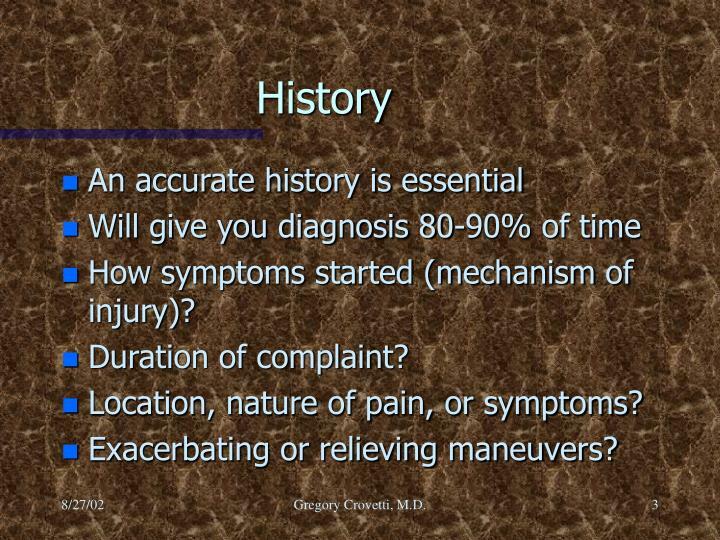 Snapping or catching is positive for labral tear. 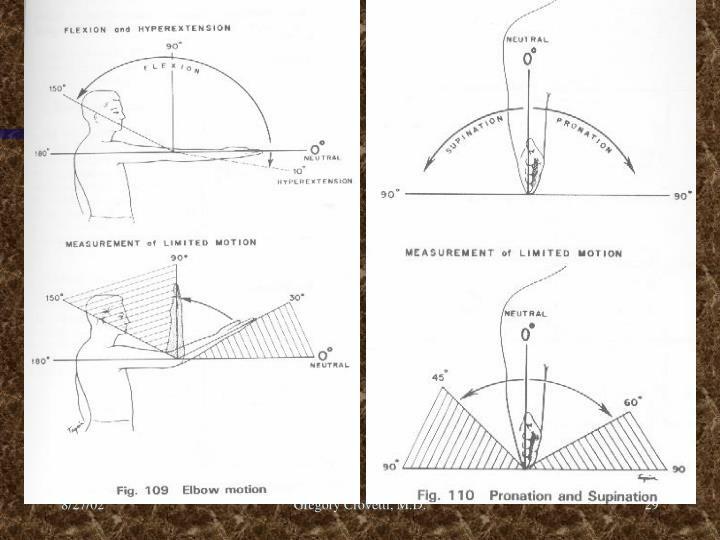 Yergason’s test: Elbow flexed to 90 degrees, forearm pronated, resistance to supination is applied as the patient also laterally rotates the arm. 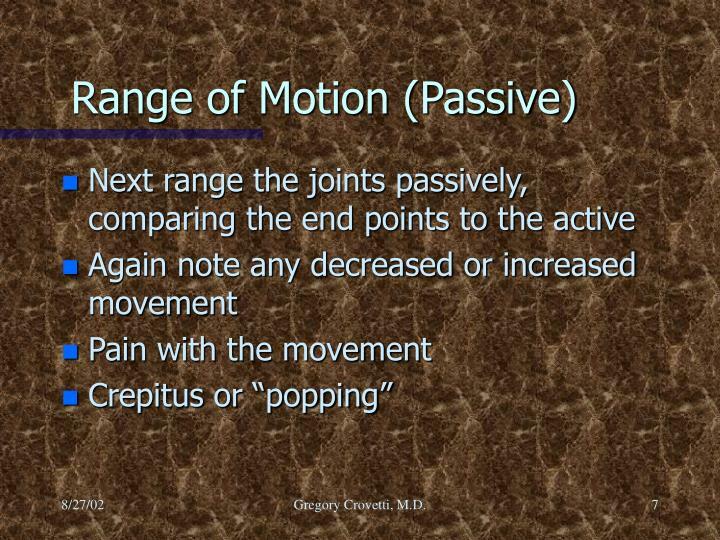 Positive if pain in the bicipital groove and indicates bicipital tendinitis. Supraspinatus (empty can/ Jobes) test: The shoulder is forward flexed at 30 degrees, arms straight and thumbs pointing to ground, a downward force is applied to the arms. 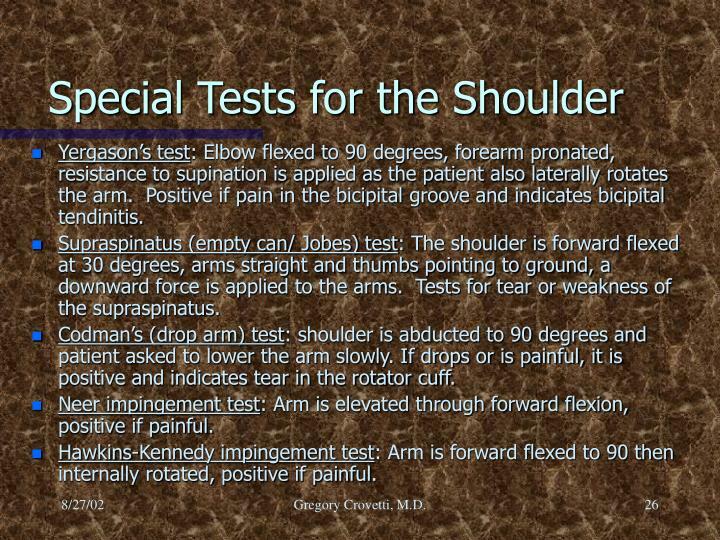 Tests for tear or weakness of the supraspinatus. 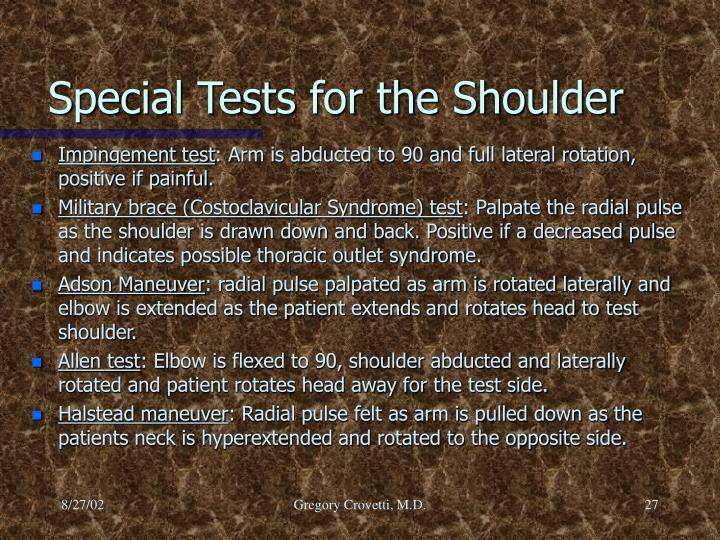 Codman’s (drop arm) test: shoulder is abducted to 90 degrees and patient asked to lower the arm slowly. 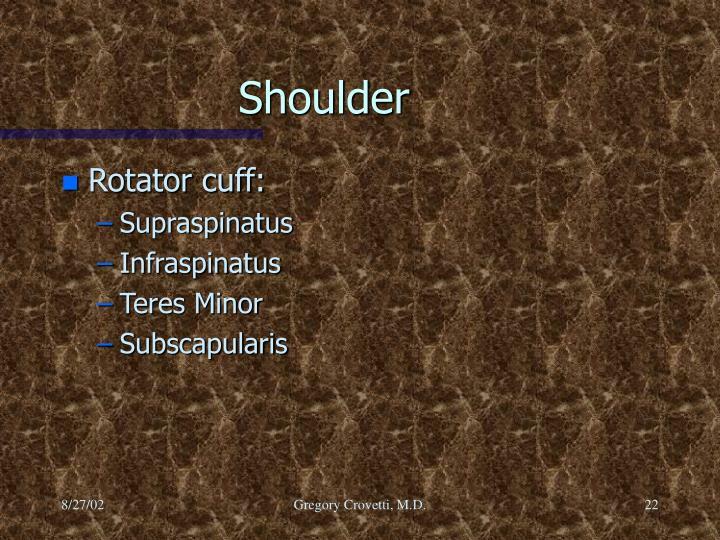 If drops or is painful, it is positive and indicates tear in the rotator cuff. Have patient make a fist and extend and spread the fingers. Cascade sign: Patient flexes the fingers, the tips should all converge toward the scaphoid tubercle. If they do not, it may indicate a fracture in that finger. Boutonniere deformity: Extension of the MCP and DIP joints and flexion of the PIP joint. 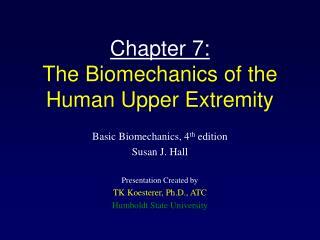 This is due to a rupture of the central tendinous slip of the extensor hood. Swan-neck deformity: Flexion of the MCP and DIP joints, with extension of the PIP joint. 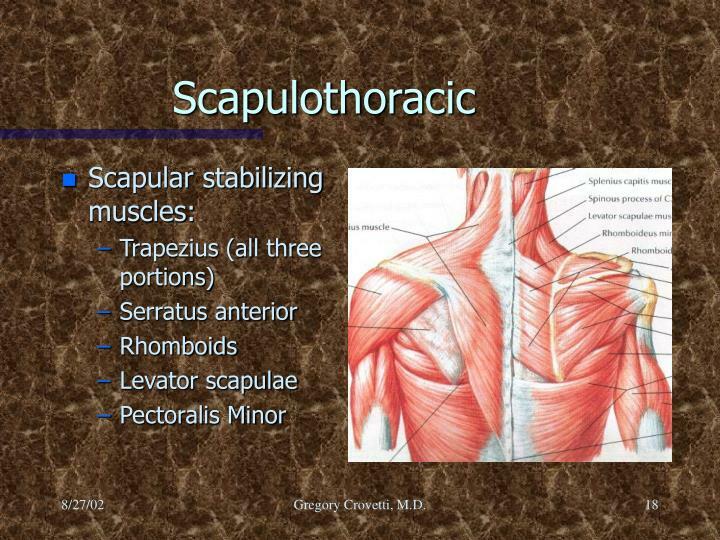 This is due to contracture of the intrinsic muscles. Seen after trauma or in RA. 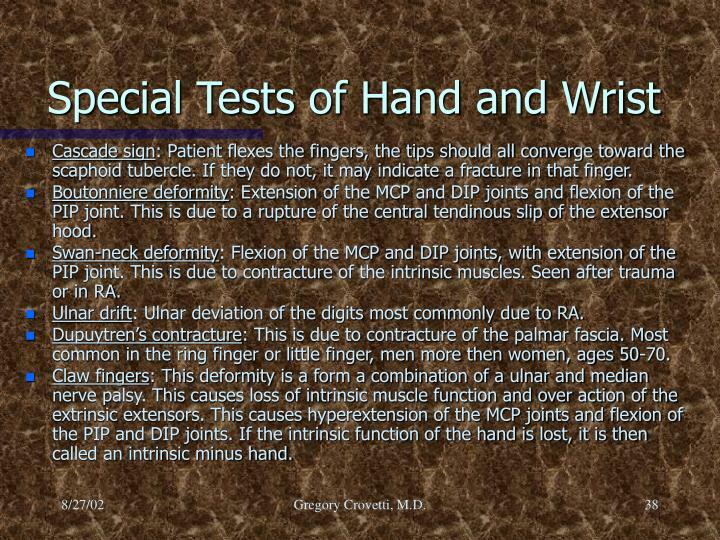 Ulnar drift: Ulnar deviation of the digits most commonly due to RA. 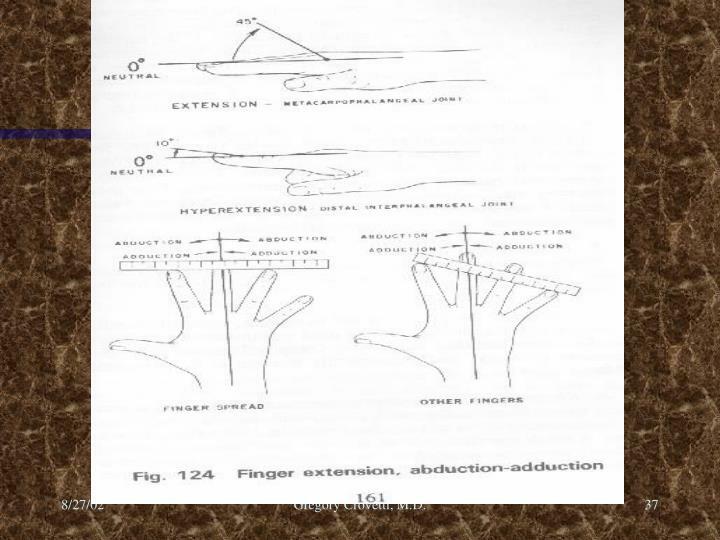 Dupuytren’s contracture: This is due to contracture of the palmar fascia. Most common in the ring finger or little finger, men more then women, ages 50-70. Claw fingers: This deformity is a form a combination of a ulnar and median nerve palsy. 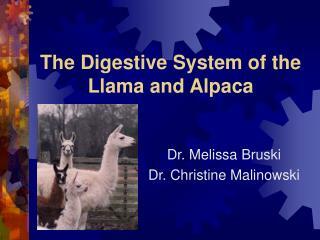 This causes loss of intrinsic muscle function and over action of the extrinsic extensors. 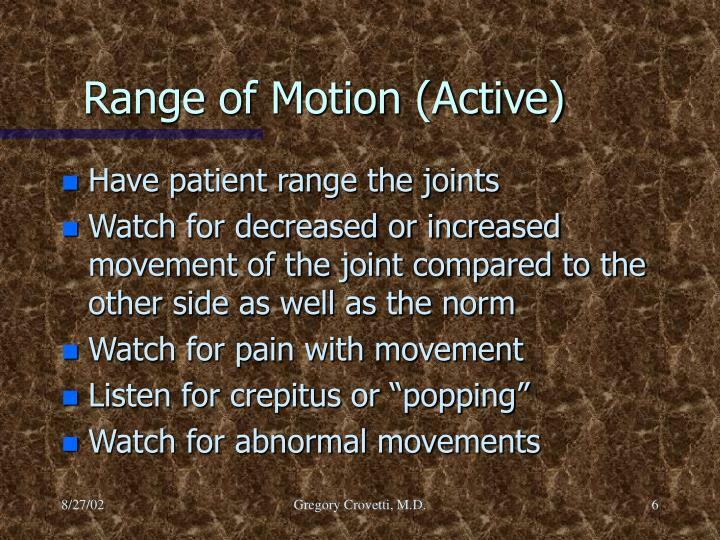 This causes hyperextension of the MCP joints and flexion of the PIP and DIP joints. 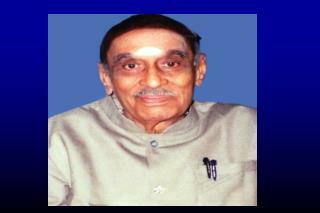 If the intrinsic function of the hand is lost, it is then called an intrinsic minus hand. Trigger finger: Results from a thickening of the flexor tendon sheath, causing sticking of the tendon. At later stages the finger can become stuck in flexion, needing to be passively extended. 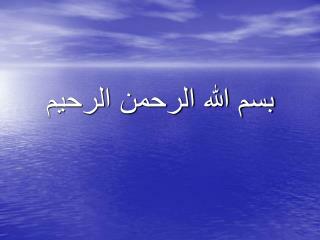 Associated with RA. 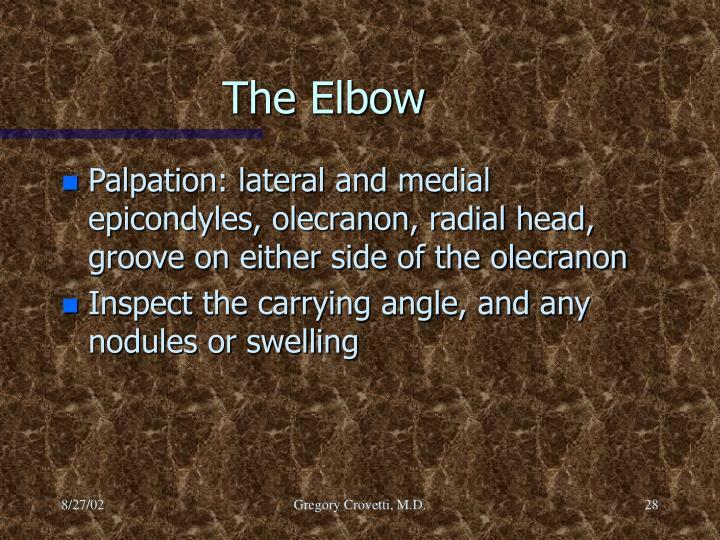 Bishop’s Hand: (Benediction Hand) Secondary to ulnar nerve palsy. There is wasting of the hypothenar, interossei, and the two medial lumbrical muscles. Flexion of the 4th and 5th fingers is the most noticeable deformity. 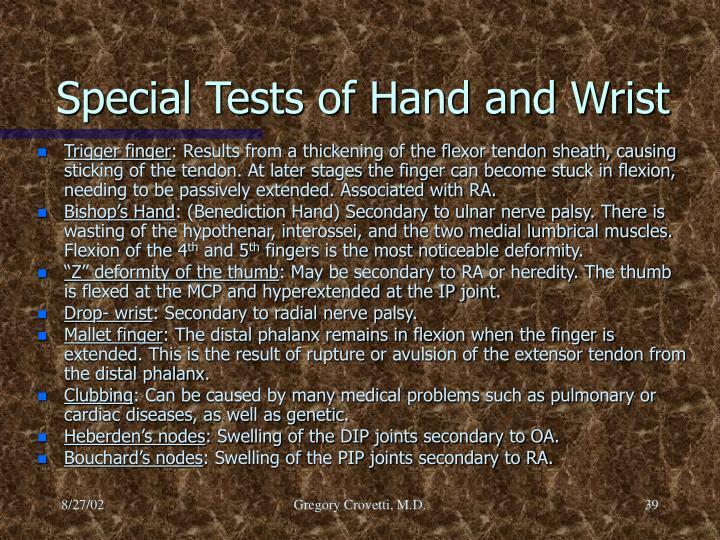 “Z” deformity of the thumb: May be secondary to RA or heredity. 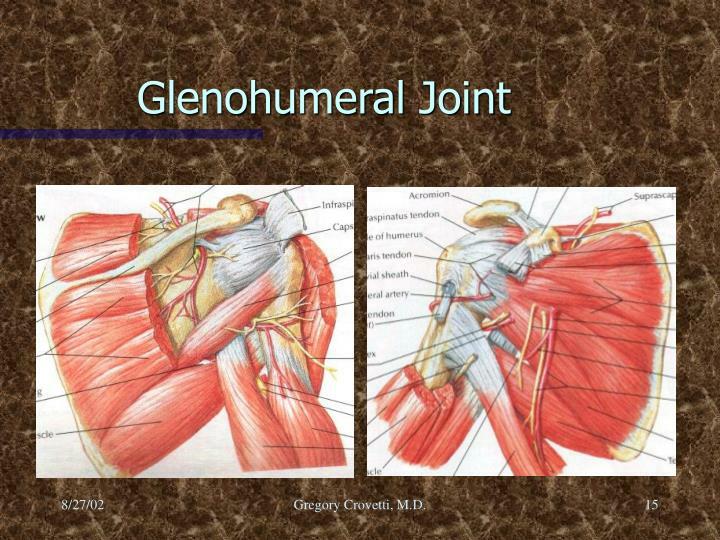 The thumb is flexed at the MCP and hyperextended at the IP joint. 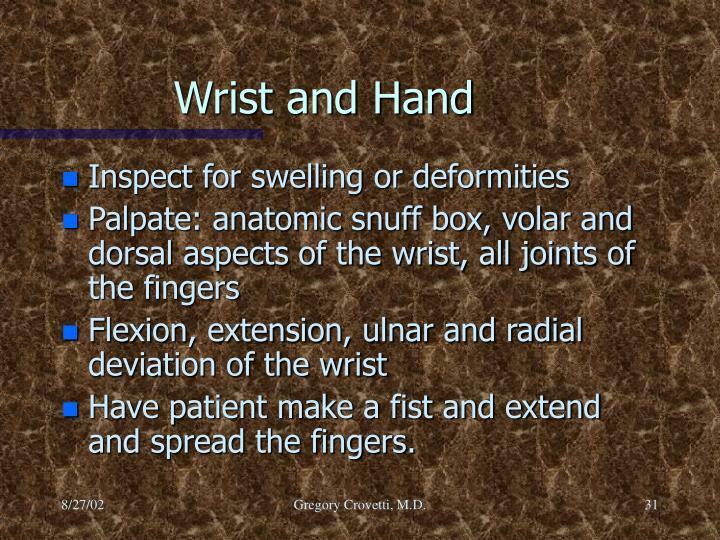 Drop- wrist: Secondary to radial nerve palsy. Mallet finger: The distal phalanx remains in flexion when the finger is extended. This is the result of rupture or avulsion of the extensor tendon from the distal phalanx. Clubbing: Can be caused by many medical problems such as pulmonary or cardiac diseases, as well as genetic. 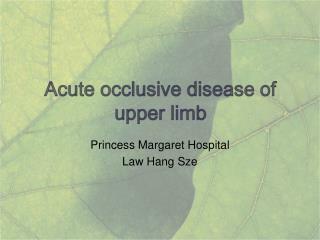 Heberden’s nodes: Swelling of the DIP joints secondary to OA. 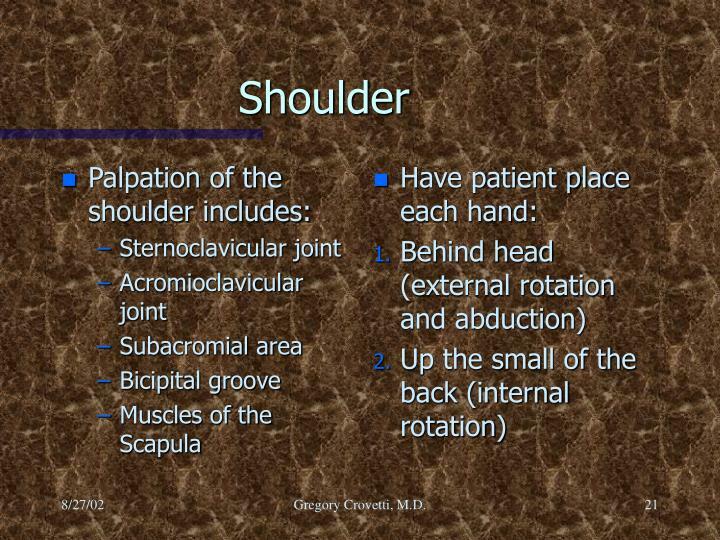 Bouchard’s nodes: Swelling of the PIP joints secondary to RA. Ganglion cyst: Localized swelling usually on the dorsum of the hand. 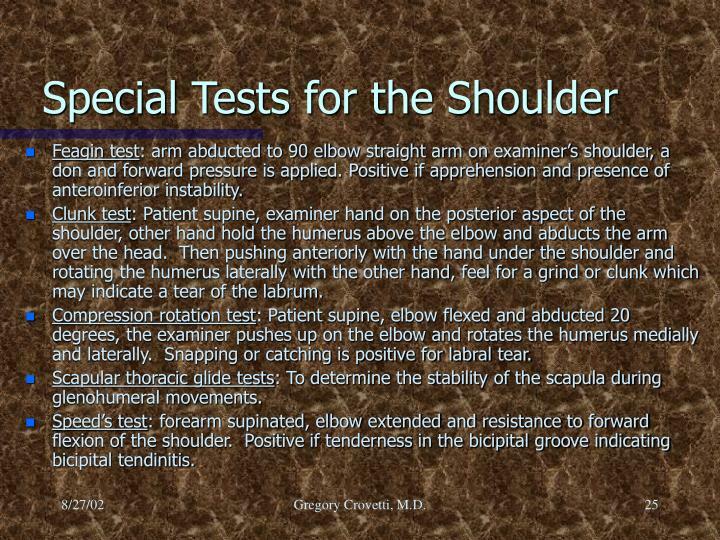 Carpal Compression test: Pressure applied directly to the carpal tunnel for 30 seconds. 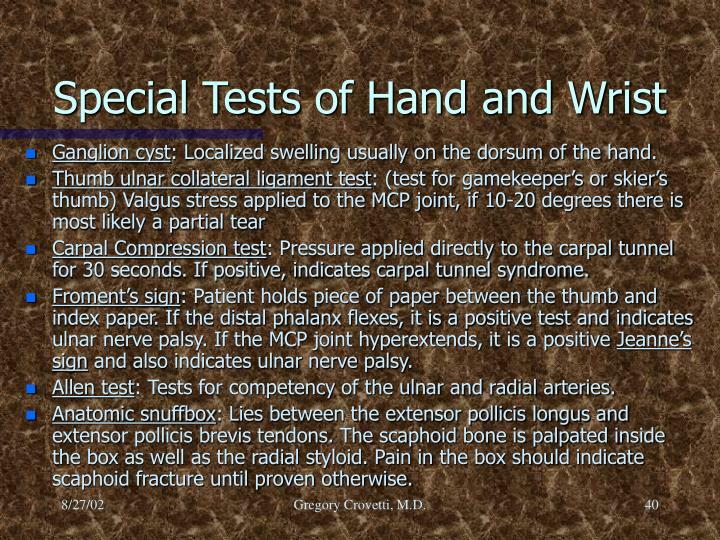 If positive, indicates carpal tunnel syndrome. Froment’s sign: Patient holds piece of paper between the thumb and index paper. 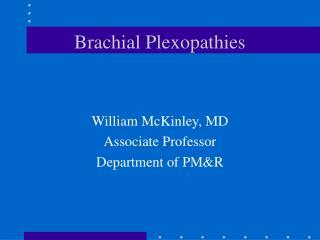 If the distal phalanx flexes, it is a positive test and indicates ulnar nerve palsy. 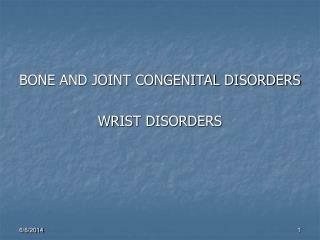 If the MCP joint hyperextends, it is a positive Jeanne’s sign and also indicates ulnar nerve palsy. 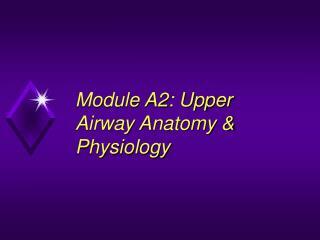 Allen test: Tests for competency of the ulnar and radial arteries. 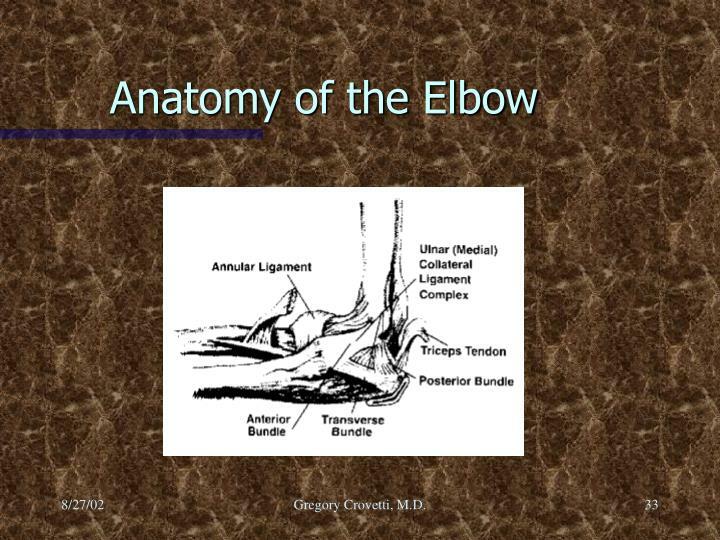 Anatomic snuffbox: Lies between the extensor pollicis longus and extensor pollicis brevis tendons. 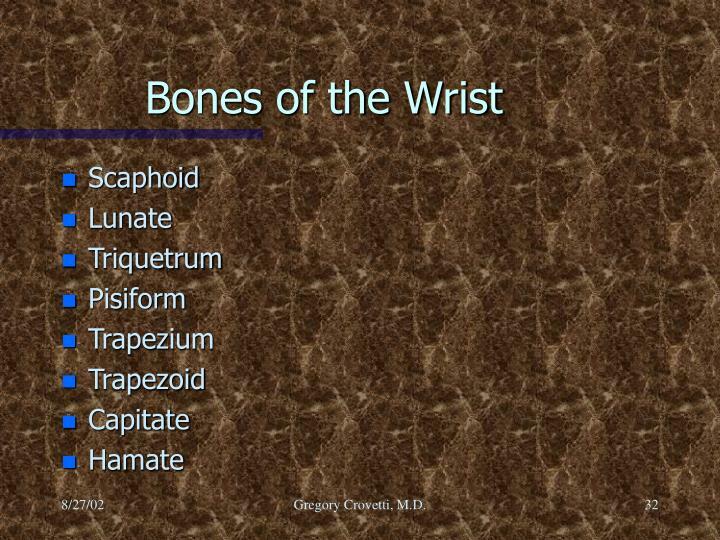 The scaphoid bone is palpated inside the box as well as the radial styloid. Pain in the box should indicate scaphoid fracture until proven otherwise. 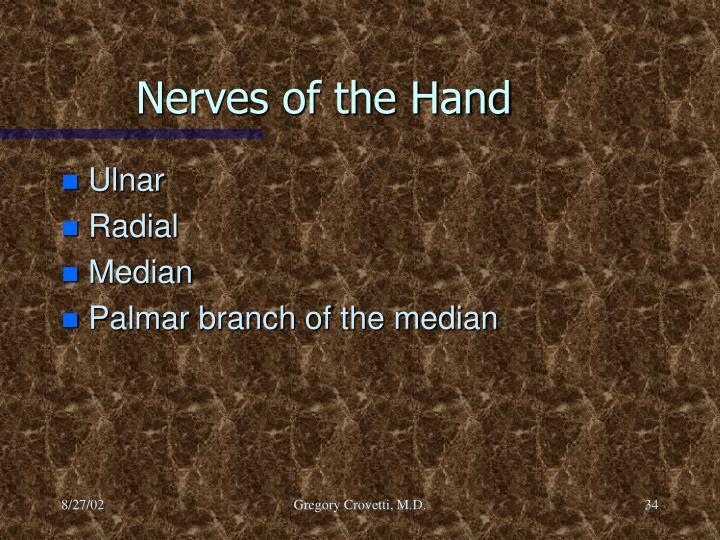 Guyon’s canal: (pisohamate) Through this canal runs the ulnar nerve. If compression of the canal occurs, there is sensation lose to the fingers and muscle weakness in the hand of ulnar distribution. 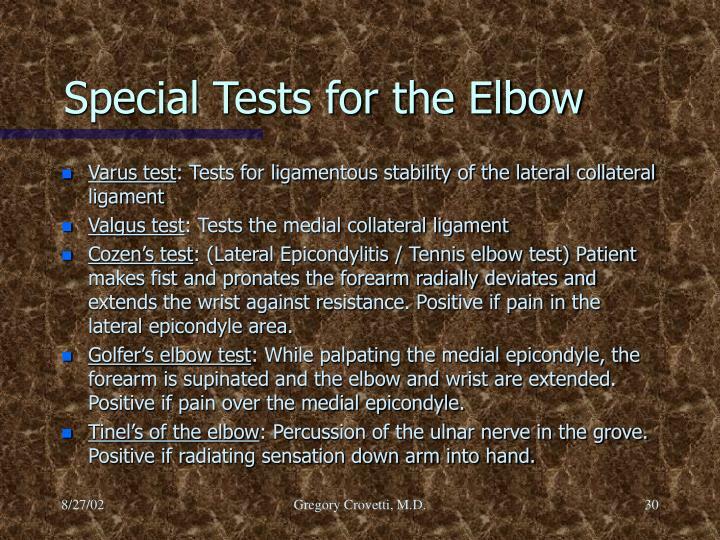 >35 degrees indicates a torn ulnar and accessory collateral ligaments. Murphy’s sign: Patient makes a fist, if the head of the third metacarpal is level with the second and fourth metacarpals, it is a sign of a lunate dislocation. 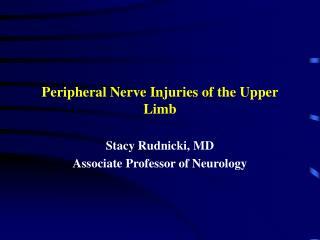 Retinacular ligament test: Test for the structures around the PIP joint. 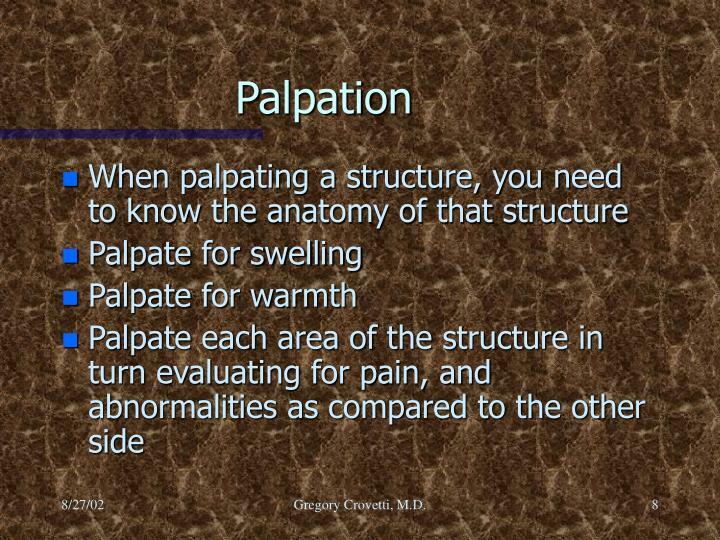 The patient is passive, the PIP joint is held in extension and the DIP is flexed. 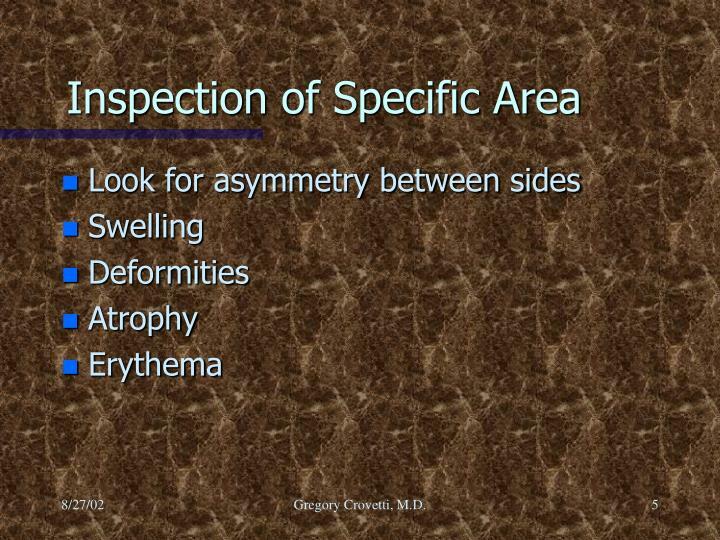 If the DIP does not flex, the retinacular ligaments (collateral) or capsule is tight. 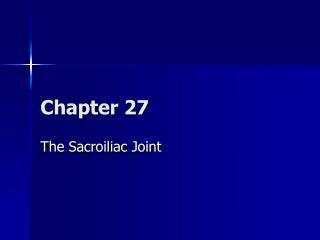 The PIP joint is the flexed, if the DIP now flexes easily, the retinacular ligaments are tight and the capsule is normal. 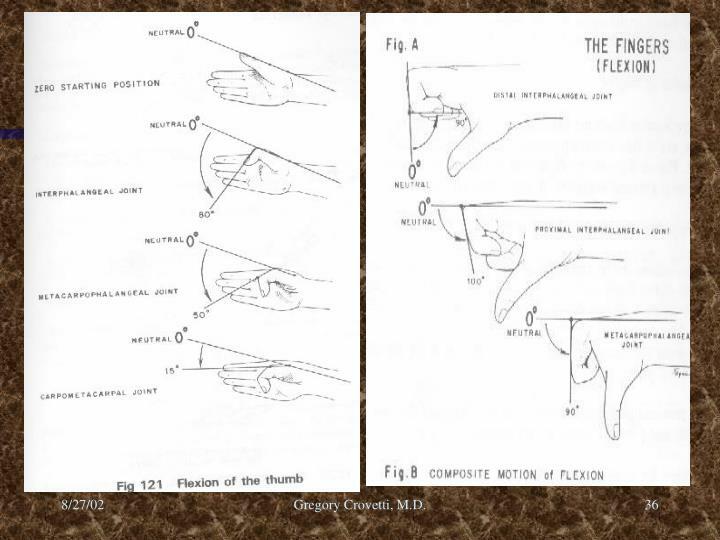 Lunatotiquetral Ballottement (Reagan’s test): The triquetrum is grasped between the thumb and second finger of one hand and the lunate between the thumb and second finger of the other hand. 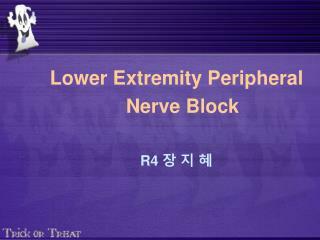 The lunate is then moved up and down, if any laxity, crepitus or pain it indicates a positive test for Lunatotriquetral instability. 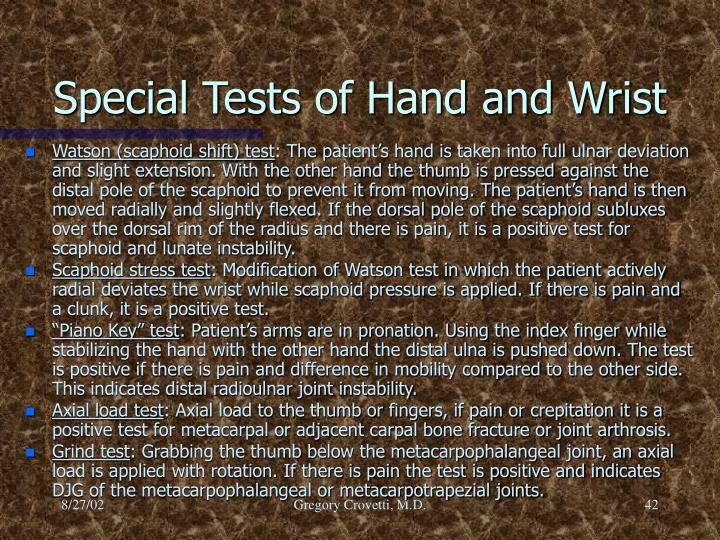 Watson (scaphoid shift) test: The patient’s hand is taken into full ulnar deviation and slight extension. With the other hand the thumb is pressed against the distal pole of the scaphoid to prevent it from moving. The patient’s hand is then moved radially and slightly flexed. If the dorsal pole of the scaphoid subluxes over the dorsal rim of the radius and there is pain, it is a positive test for scaphoid and lunate instability. Scaphoid stress test: Modification of Watson test in which the patient actively radial deviates the wrist while scaphoid pressure is applied. If there is pain and a clunk, it is a positive test. “Piano Key” test: Patient’s arms are in pronation. Using the index finger while stabilizing the hand with the other hand the distal ulna is pushed down. 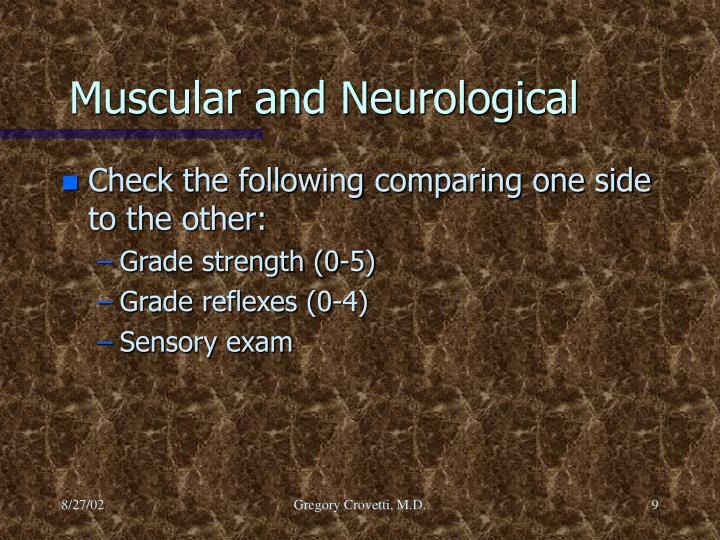 The test is positive if there is pain and difference in mobility compared to the other side. 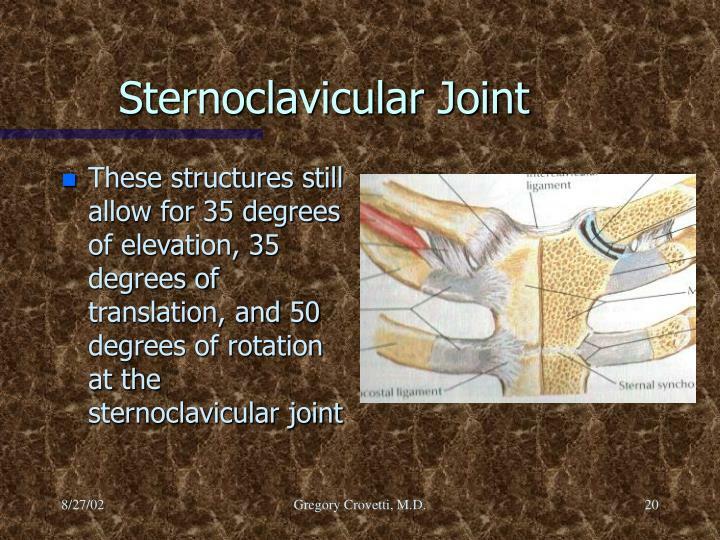 This indicates distal radioulnar joint instability. 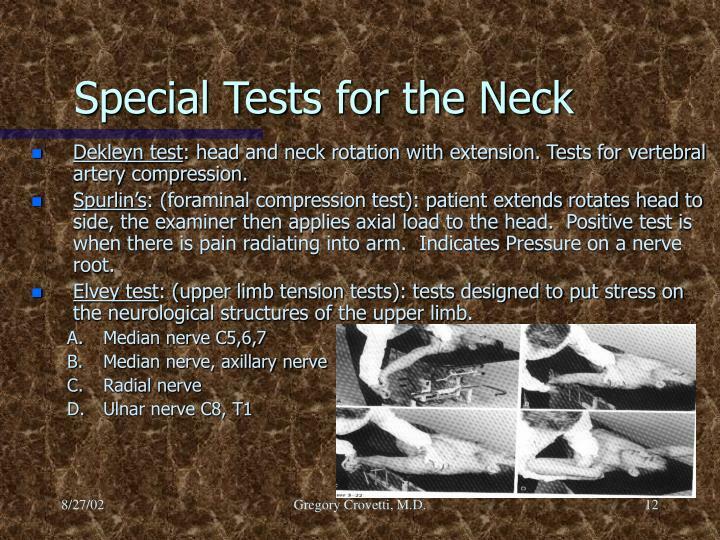 Axial load test: Axial load to the thumb or fingers, if pain or crepitation it is a positive test for metacarpal or adjacent carpal bone fracture or joint arthrosis. 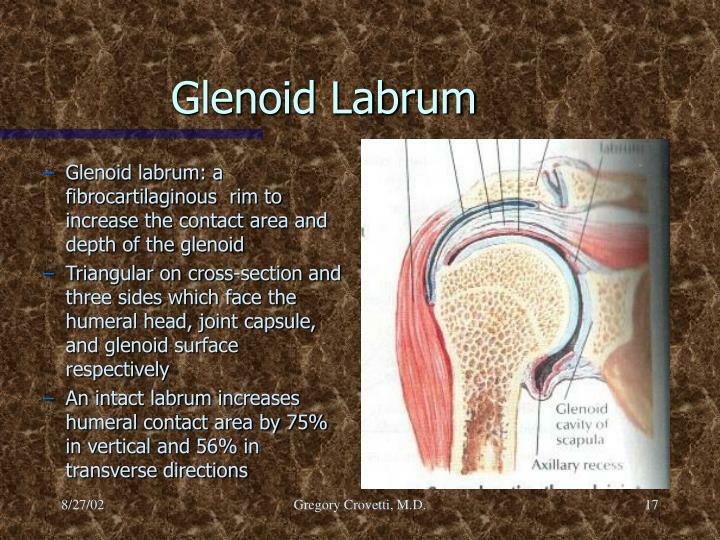 Grind test: Grabbing the thumb below the metacarpophalangeal joint, an axial load is applied with rotation. 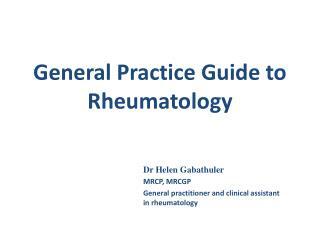 If there is pain the test is positive and indicates DJG of the metacarpophalangeal or metacarpotrapezial joints. 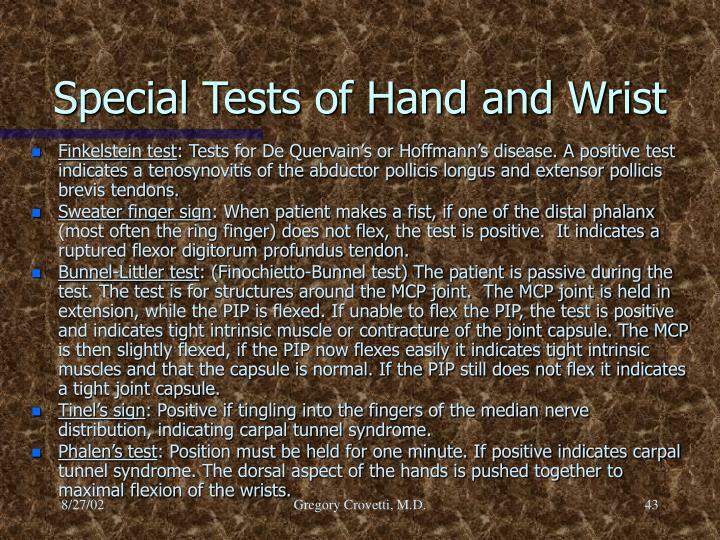 Finkelstein test: Tests for De Quervain’s or Hoffmann’s disease. A positive test indicates a tenosynovitis of the abductor pollicis longus and extensor pollicis brevis tendons. Sweater finger sign: When patient makes a fist, if one of the distal phalanx (most often the ring finger) does not flex, the test is positive. It indicates a ruptured flexor digitorum profundus tendon. Bunnel-Littler test: (Finochietto-Bunnel test) The patient is passive during the test. 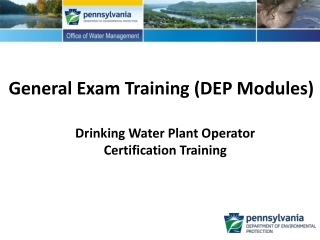 The test is for structures around the MCP joint. 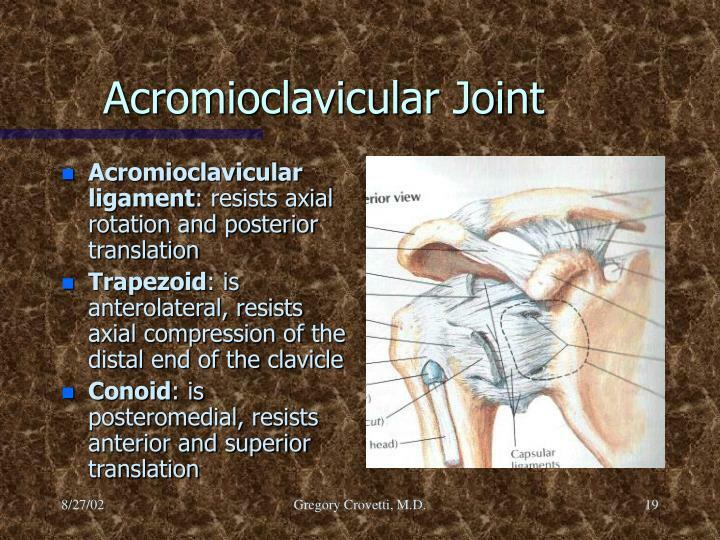 The MCP joint is held in extension, while the PIP is flexed. 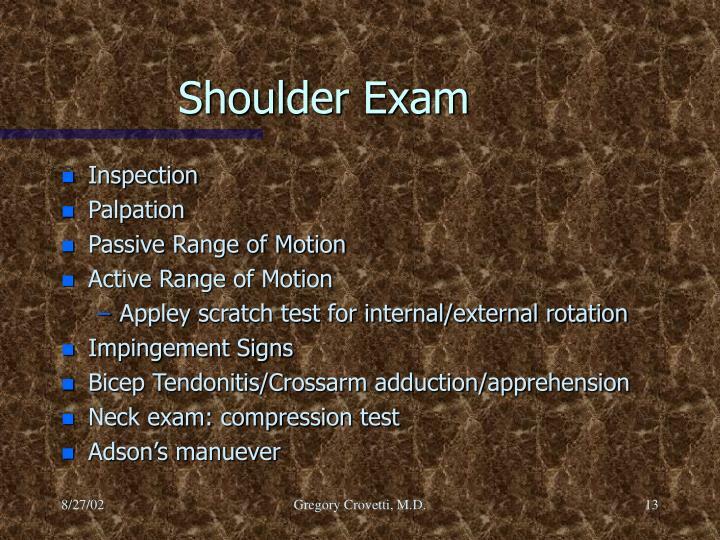 If unable to flex the PIP, the test is positive and indicates tight intrinsic muscle or contracture of the joint capsule. The MCP is then slightly flexed, if the PIP now flexes easily it indicates tight intrinsic muscles and that the capsule is normal. 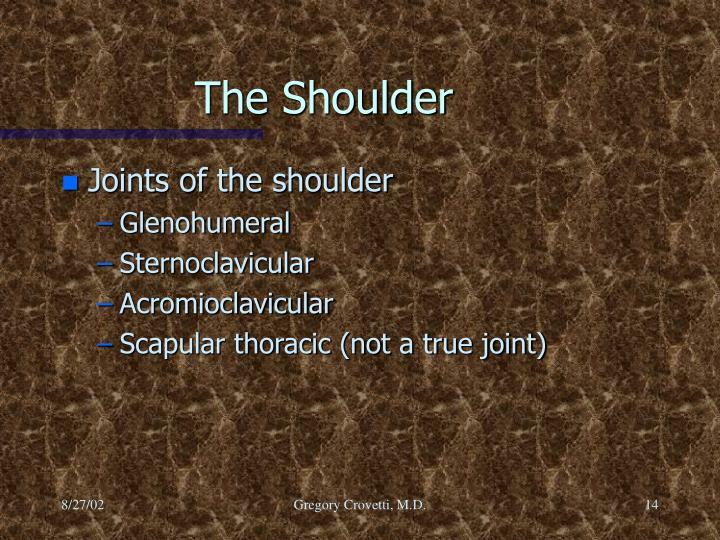 If the PIP still does not flex it indicates a tight joint capsule. Tinel’s sign: Positive if tingling into the fingers of the median nerve distribution, indicating carpal tunnel syndrome. 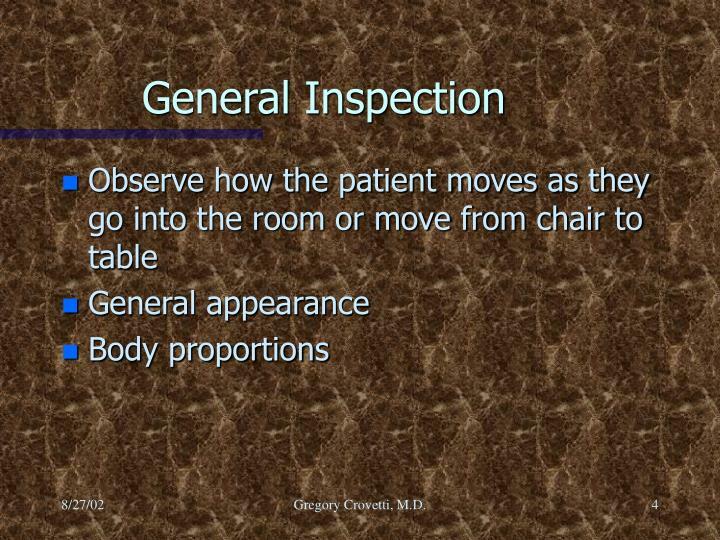 Phalen’s test: Position must be held for one minute. 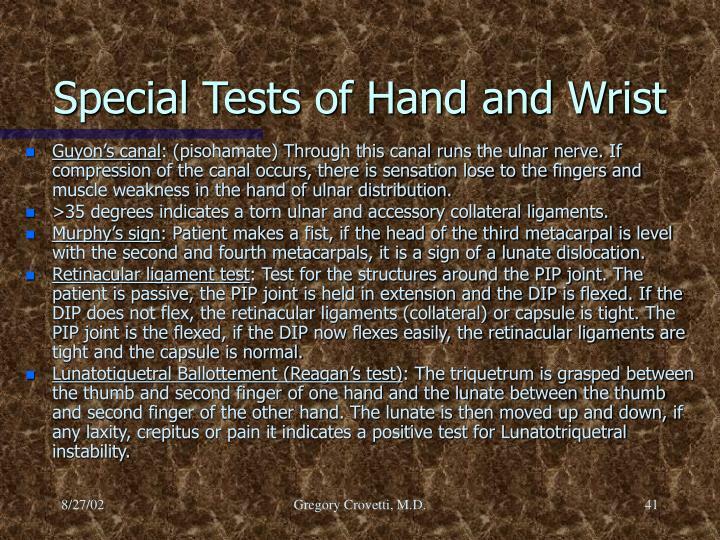 If positive indicates carpal tunnel syndrome. 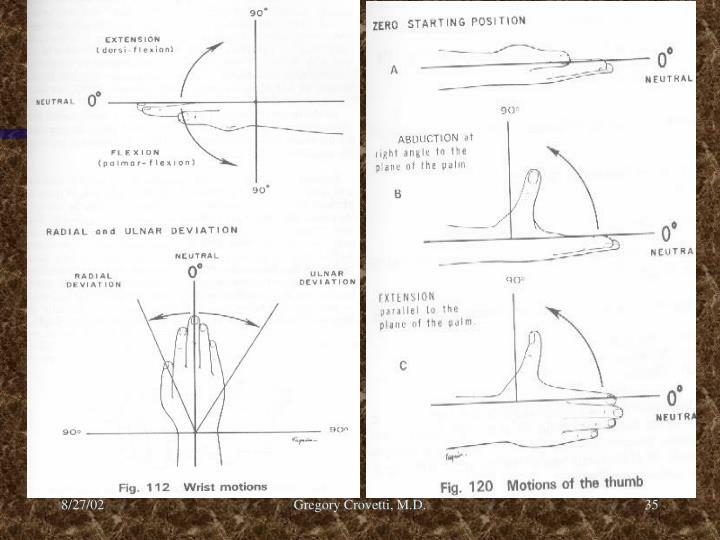 The dorsal aspect of the hands is pushed together to maximal flexion of the wrists. 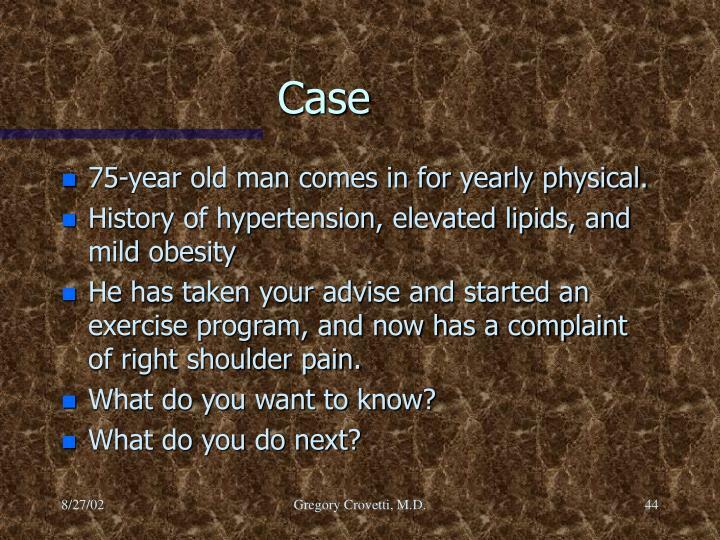 75-year old man comes in for yearly physical. 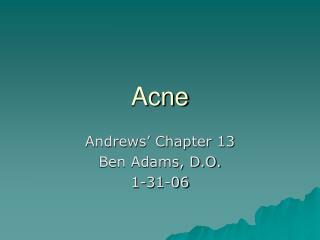 He has taken your advise and started an exercise program, and now has a complaint of right shoulder pain. GFEBS General Ledger -. 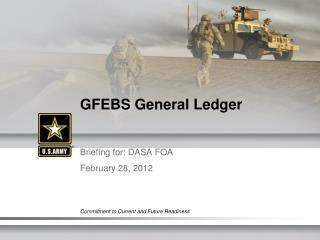 briefing for: dasa foa	february 28, 2012. agenda. general ledgers what is general ledger? what is general ledger in gfebs? various gls how gfebs reporting works fi/fm integration sof vs. budgetary ledger vs.